If you could do only three things for SEO, what would they be? This is a question encountered by many smaller businesses, and even somewhat larger companies, either due to not having enough people (time) and/or dollars available to invest in a big way. If this is a scenario you’re facing, what follows are three minimal SEO tasks you must do. The first step is to make sure that your site is getting found! The best way to do this is to check your indexing status in Google Webmaster Tools and see how many of your pages are indexed by Google. Once you’re logged in, click on “Health” and then “Index status” in the menu on the left. The first thing to look at is the number of indexed pages, in this case, 887. How many did you expect? Obviously, if you think you have 1,000+ pages that you want Google to index and Google shows 10 indexed pages, you have a problem. In the case of this particular site, the problem looks to be the opposite of that – 887 pages indexed and 5,751 “Not Selected”? Not Selected: URLs from your site that redirect to other pages or URLs whose contents are substantially similar to other pages. To keep this simple, the bottom line here is to get a quick indication whether you have a problem. Too few pages being indexed? You have a problem. Too many, or too many that are “Not Selected”, that could be a problem too. If you find you have a problem, what is the next step? Unfortunately, that isn’t an easy one to take on by yourself, due to your time constraints. That means the next step is to get some help and to get your indexing problem diagnosed and fixed. (Footnote to this diagnosis step: Some blog software packages, such as WordPress, create lots of category type pages, and these could explain why you have a lot of pages that were Not Selected, but you still need to determine how you want to address that, and expert advice on that topic is still something you should get). The next step is to figure out whether you are effectively competing for keywords that users might enter into a search engine, which would indicate that they are a prospect for you. If one of the products you offer is left-handed golf clubs as a product, for example, is there a page on your site focused on left-handed golf clubs? If this is one of your products, at a minimum, you need a page dedicated to left-handed golf clubs where the search phrase “left handed golf clubs” is featured in the title of the web page (this is the title tag in the head section of your web page source code), and in the content on the page. Implement such pages for each major product/service you offer. 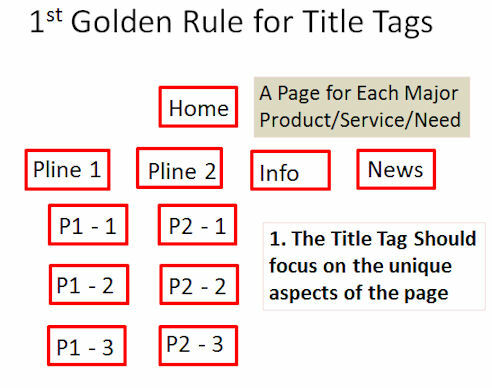 Pay a lot of attention to your title tags, and they can help you understand how to focus your pages. I have two golden rules for title tags. The title tag should focus on the unique aspects of the page. Very important too! 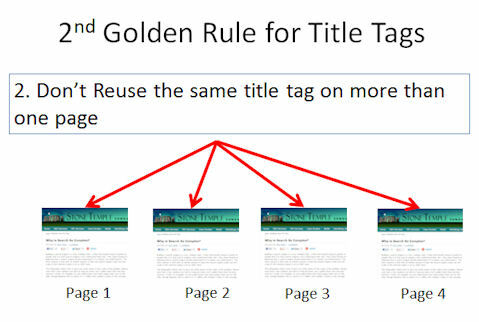 Do the best you can to never duplicate a title tag on your site. If it isn’t possible to come up with a different title tag for a particular page, then why does it exist? This is great question to ask yourself. What keywords should you focus on? There is a good article on keyword research here that goes into that in a little more detail. The two main tools you should use are the Google AdWords Keyword Tool, and the keyword research tool you find inside Bing Webmaster Tools. The Bing tool is nice because it provides actual numbers for the keyword search volume on Bing (the AdWords tool doesn’t reflect actual numbers from Google, but are instead some sort of estimate). The key realization here is that getting your indexing issues resolved and the keywords addressed is only the start of the SEO process. You need to spend some time on that because if you don’t you can’t even compete for ranking on a keyword. You won’t get traffic for “left handed golf clubs” if the search engines can’t find your site (Step 1), or if you don’t have a page dedicated to the topic of left-handed golf clubs. Links remain the main signal search engines use to determine which of those 388,000 sites shows up on the first page of results. Bearing in mind that this column is about people who don’t have the time or budget for SEO, my suggestion is that you integrate the knowledge that you need links into your day to day business thinking. Better still, pursue marketing activities you would value even without search engines, but that will also get you some links. Can you give an interview to a media site (traditional media or a blog)? Can you write an article and place it as a guest post on an authoritative site? If you’re a local business, can you get the local chamber of commerce to link to you? You have to avoid the easy way out, and don’t buy links, or purchase one of those services that offers links by the hundreds (these won’t help you anyway, and may get you penalized by Google), and the like. For purposes of this exercise, make sure that any link you obtain also offers brand building value. If you find yourself arguing that a link might bring brand building value, then it doesn’t. You shouldn’t need to defend the link, you should know that it provides brand value without having to justify it. What about social you ask? Social media isn’t yet a major driver of SEO signals. There are some specific cases where it does. For example, when someone follows your brand page on Google+, this can cause your pages to rank higher in the search results for that person, and that person only. It doesn’t cause your page to rank higher for people who haven’t followed you. Bing has taken a different tack, and social data can cause you to show up in their social sidebar, but doesn’t appear to directly impact the traditional web search results. If you don’t have time and budget, you’re in a bit of a tough spot, but these three steps should at least let you get your toes in the SEO waters. Anybody have other suggestions for what would be on your must-do three step list? Or a suggestion of an additional item that someone can execute in 15 minutes or less? Let me know in the comments below. Editor’s note: This column originally was published on September 16, 2012, and comes in at No. 2 on our countdown of the 10 most popular Search Engine Watch columns of 2012. As the clock ticks down to 2013, we’re celebrating the Best of 2012 by revisiting our most popular columns, as determined by our readers. Enjoy and keep checking back!